Now is the time to THINK INSIDE THE BOX! But how many companies take the ZAPPOS approach, putting company culture and employee morale FIRST before everything else? A company with highly engaged employees achieves a financial performance FOUR TIMES greater than companies with poor engagement. It means that investing in things that boost employee morale could lead to an ROI four times higher than those advertising campaigns or sales training programs you've been running. The study also found that only 45% of Americans are satisfied with their jobs, the lowest level ever recorded. Why? Maybe it's because companies today are hyper-focused on their profits rather than their people? Or maybe they don't realize the powerful impact an Employee Appreciation Program can actually have on the bottom line. 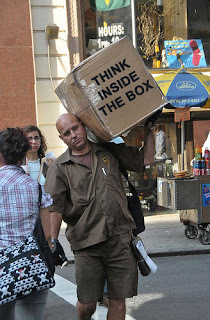 Here's another theory... during tough economic times, business owners believe they have to "think outside the box." That means looking OUTWARD toward things like expansion, mergers, acquisitions, diversification, new markets, new product lines and new opportunities. When times get tough, you have to get creative, right? Wrong! Because as a result of looking OUTWARD, the employees on the INSIDE are often neglected. They start to become disengaged and the snowball begins rolling down the hill. Think about it... What typically happens during tough economic times that squashes employee morale? Every expense is scrutinized, cost-cutting becomes extreme (like watered down coffee in the break room! ), salaries are frozen, layoffs occur, workloads increase and benefits are reduced or taken away completely. All of this adds up. And the result is stressed-out, disengaged employees that aren't pulling as hard as you'd like. In other words, the reindeer don’t wanna pull the sleigh. What effect does this have on your bottom line? Research shows that companies with disengaged employees had a total shareholder return that was 44% lower than average. However, companies with high levels of engagement outperformed the total stock market index and posted shareholder returns 19% higher than average. And all of this seems to trace back to the root problem of business owners looking OUTSIDE the company more than they look INSIDE the company. So why not take the opposite approach? Maybe now is the time to start thinking INSIDE THE BOX. That means looking INWARD (first toward your employees, then toward your current customers) and doing things that create what I call "Corporate Patriotism"... a strong sense of community, loyalty, confidence, stability, comfort, safety and assurance. It means taking care of the “bird in the hand” instead of pursuing the two in the bush. Then, when the economy starts booming again and everyone feels secure, that’s when you can start thinking outside the box. But when stress-levels are high and risk-tolerance is low, you must turn your attention INWARD instead of OUTWARD. Take care of the people inside of your camp and they’ll take care of you. They want you to focus on them! Not new markets, new product lines or new customers. What do you think? Based on this research, does it make sense to start focusing more on the people inside the box? What are you doing to raise the team spirit?